Please note that I am hard at work on a new novel and therefore events are limited. the film ASHES IN THE SNOW. Events added as confirmed. Check Back Soon! U.S. Film Release of Ashes in the Snow! Dates and showtimes will be listed on Fandango in January. Amazon, iTunes, DISH, DirecTV, and Cable TV providers. ASHES IN THE SNOW for teachers and librarians. 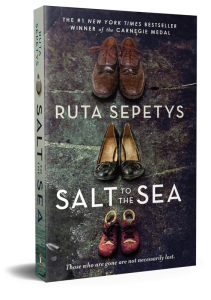 A discussion of Salt to the Sea and writing. The Lithuanian Culture Research Institute. à chaque heure : 17h, 18h, 19h, 20h, 21h et 22h. *ensuite, vous êtes invités à vous déplacer dans un autre lieu pour assister à une nouvelle session. the film’s director, Marius Markevicius. NOTE: This is a free, public event but space is limited. All guests must RSVP HERE. Ruta Sepetys, Ransom Riggs, and Tahereh Mafi. This program will be in English. Book signing to follow. and share elements and techniques for aspiring novelists. and discuss them with Ruta Sepetys. This program will be in English and German. Author presentation, discussion, and book signing. Salt to the Sea discussion and book signing. This event will be in English and Japanese. Open to SCBWI members and nonmembers. Author appearance and bookstore visit. (április 8-án (kedden) 18 órától Budapesten, az Allee Bevásárlóközpontban lévő Libri Könyváruházban! at our local indie bookstore. Join me for your holiday shopping! 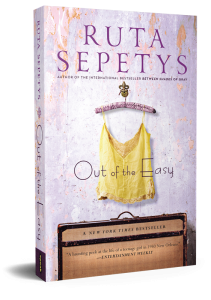 “Out of the Easy” Publication Date! A “behind-the-text” discussion of my two novels and the power of story. Come early, attend the discussion and then see Bruce Munro’s LIGHT exhibit! Join me for a conversation on writing and the power of story. Author Appearance. Book and Writing Discussion. Free event. Ruta Sepetys para comentar sus dos novelas “Entre tonos de gris” y “El color de los sueños”. a la autora en la Mediateka BBk (Alhóndiga Bilbao). Orleans de los años cincuenta en “El color de los sueños”. Author appearance and book discussion. a special BEA bound manuscript of my new book “Out of The Easy” set for publication in 2013! Open to the public. Tix must be requested through Michelle Butcher at The Earls High School. A discussion of Between Shades of Gray and associated Baltic history. 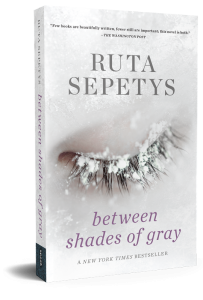 A discussion of Between Shades of Gray and book signing. Moderated panel discussing YA literature, writing, and publishing. A discussion of Between Shades of Gray and associated history. A discussion of Between Shades of Gray and writing historical novels.